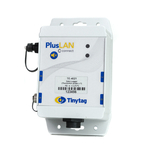 Help and support for Tinytag Plus LAN data loggers, including FAQs, datasheets and technical documents. Tinytag Plus LAN provides automatic temperature, relative humidity, voltage, current and count monitoring using Ethernet connectivity. Please select your logger model from the list below.